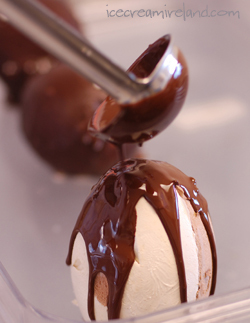 We’ve been playing around with making ice cream Easter eggs. I had bought an egg mould some time ago, and we poured the ice cream into it. Then we wrapped it in chocolate (we tried both dipping and pouring, and both come out well) and added some caramalised hazelnut nibs. I don’t know if the customers will get any. We’re busy eating away! But I REALLY want one! Brilliant idea, Kieran – I bet it tastes wondeful! They look so good! you’ll have to open in Limerick!! 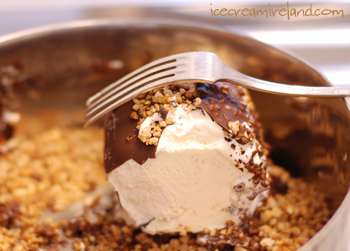 Brilliant idea… Are you doing Guinness ice cream yet? If not you should be, cos someone in Wales already is…. DO you do deliveries? Sorry, Tricia, but weÂ´ve eaten them all! What a lovely and delicious idea! yum yum in my tum!!! !